Today has been a very sad day for London, the antithesis of the celebrations which were due yesterday for winning the 2012 Olympic bid. This morning unfolded as one of the worst days in London's recent history as terrorists attacked first the London Underground and then a bus near Russell Square. I managed to avoid the attacks - although apparently by quite a close margin - though I know many others were not so lucky. My heart goes out to those who had this cowardly act inflicted upon them for no reason, their familes, their friends, their loved ones. My department had today arranged a trip for the people on our course to pay a visit to the Ordnance Survey in Southampton. We had left London by about 9.20, unaware of any of the events which had happened on the Underground in the preceeding half an hour. Garbled reports of power surges and then terrorist attacks started to filter through to the radio on the coach but it wasn't until later that we realised the extent of what had happened so close to the place we had left from. The whole day has left me a little shaken. To show you some of the reasons why, I have created a map (partly to learn more about programming using the Google Maps API) that plots the events of this morning. You can scroll around and click on markers to find out more. It is frightening how close these events were to affecting me and the people I was with this morning, my friends and so many other innocent people in London. The London I came back to this afternoon is a different London, a London I never wanted to experience. 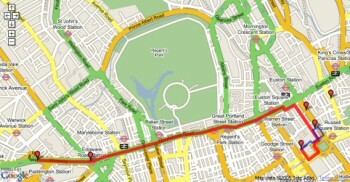 I read earlier in the week about a discussion on open geodata occuring in London this week. Being interested in what they had to say I thought I might as well pop along and listen to the presentations. Open geodata, for those of you who may not know, is any kind of data which has some kind of geographic reference (such as a postcode, a place name or anything else which references a place on earth). In the US, much of this is freely available to the public because just about everything produced by government agencies can be used without any restrictions. In the UK however, there is a Crown Copyright placed on just about all of the geographic data produced. The first presentation this evening was basically talking about ways of creating new geodatasets which could then be reused, by sending people out on the roads with GPS receivers, tracing roads off satellite or other aerial photography or using maps on which the copyright had already expired (dating back to the 1950s). Steve Coast, the guy presenting, had begun to develop OpenStreetMap and was actually another UCL student, although on a different course to the one that I am on. The second was by Gesche Schmid, a local government manager of ICT at Medway Council who highlighted the uses of geographic data in local government using a couple of different examples from across the board. It was interesting to hear, although hardly suprising, that 75% of data within local government is considered geographic. Medway are one of the councils that has their own online GIS system, Medway Map Service, from which they apparently had to pull their electoral ward boundary data because of inaccuracies. A point which Chris Lightfoot of MySociety later mentioned as well, having worked closely with election data over recent years as a key part of a number of their projects. Giles Lane of Urban Tapestries, a geo annotation tool, then talked about location based services and their potential social uses without the expense of embedding expensive GPS chips in every mobile device. By this point in the presentations I'd started to get a nasty headache from looking at the projection screen so I wasn't able to concentrate as much as I wanted. Jo Walsh was next on stage. An open source developer and co-author of the Mapping Hacks book, she talked for a short time about the ways she'd like to see the open geodata movement progress before introducing Roger Longhorn, a geodata policy expert who was heavily involved in Euopean Union geodata policy for 7 years. Chris Lightfoot of MySociety then gave a short talk about electoral data and its quirks, pointing out just how difficult a task it is to ensure the data is all accurate and up to date. Nick Whitelegg then gave a quick introduction to his countryside mapping project, Free-Map. All in all I'm glad I attended. It was good to hear a range of different perspectives - including a director of the Ordnance Survey in the audience answering some of the questions people had about government funding of the OS. I just wish my head wasn't hurting quite so much by the end. My first full day back in London was blessed with sunshine so I decided to take a walk around Bloomsbury - the area around my university - to enjoy the weather and take some photos with my new camera. I've put seven of the photos into my London photo gallery.